Updated by Tianna DuPont, WSU Extension, February 2019. Original publication by Tim Smith, Washington State University Tree Fruit Extension Specialist Emeritus; David Granatstein, Washington State University; Ken Johnson, Professor of Plant Pathology Oregon State University. 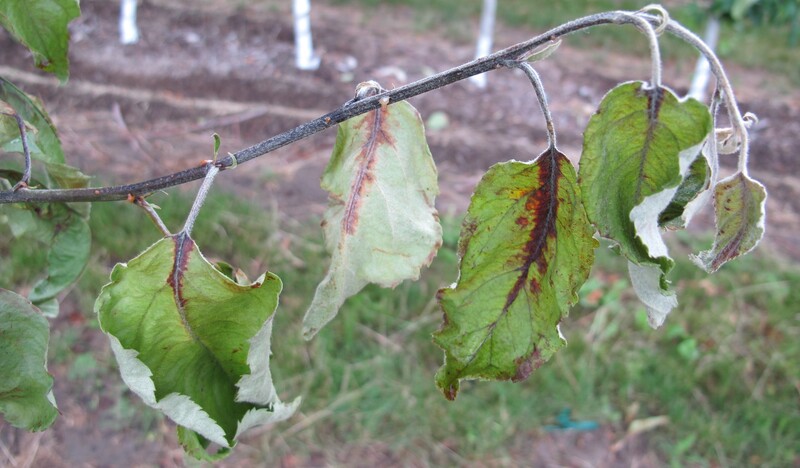 Fire blight is an important disease effecting pear and apple. Infections commonly occur during bloom or on late blooms during the three weeks following petal fall. Increased acreage of highly susceptible apple varieties on highly susceptible rootstocks has increased the danger that infected blocks will suffer significant damage. In Washington, there have been minor outbreaks annually since 1991 and serious damage in about 5-10 percent of orchards in 1993, 1997, 1998, 2005, 2009, 2012, 2015, 2016, 2017, and 2018. Fire blight is caused by Erwinia amylovora, a gram-negative, rod-shaped bacterium. The bacteria grow by splitting its cells and this rate of division is regulated by temperature. Cell division is minimal below 50°F, and relatively slow at air temperatures between 50°to 70°F. At air temperatures above 70°F, the rate of cell division increases rapidly and is fastest at 80°F. Above 95°F cell density on and in the plant can actually decline (Pusey and Curry 2004). Considered a problem for apple and pear, Erwinia amylovora has a wide host range within Rosacea and Rubus with reports on about 200 species including crab apple, hawthorn, mountain ash and Bradford pear (Timur Momol and Aldwincklke 2000). Overwintering cankers can appear black, grey or violet. Older cankers may have dry sunken tissue (Fig. 1). If the bark is cut from the edge of an active canker, reddish flecking can be seen in the wood near the canker margin. (Teviotdale 2011). Blossom symptoms become apparent one to two weeks after infection (Fig. 2). The floral receptacle, ovary, and peduncles become water soaked and dull, grayish green in appearance. Later tissues shrivel and turn brown to black. During periods of high humidity, small droplets of bacterial ooze form on water-soaked and discolored tissues. Ooze droplets start creamy white, becoming amber tinted as they age (Johnson 2000). Shoot symptoms. Tips of shoots may wilt rapidly to form a “shepherd’s crook” (Fig. 3). Leaves on diseased shoots often show blackening along the midrib and veins before becoming fully necrotic, and cling firmly to the host after death (a key diagnostic feature.) Numerous diseased shoots give a tree a burnt, blighted appearance, hence the disease name. Rootstocks infections usually develop near the graft union as a result of internal movement of the pathogen through the tree or from infection of root suckers. The bark of infected rootstocks may show water-soaking, purplish to black discoloration, cracking, or signs of bacterial ooze. Red-brown streaking may be apparent in cambium just under the bark. Symptoms of rootstock blight can be confused with Phytophthora collar rot. Malling 26 and 9 rootstocks are highly susceptible to fire blight (Johnson 2000). Figure 1. Canker on apple. Photo: T. Dupont, WSU. Figure 2. Bloom symptoms 12 days after infection. Photo: T. Dupont, WSU. Figure 3. Characteristic shepards crook. Note presence of ooze. Photo: T. Dupont, WSU. Figure 4. Rootstock infections may appear water soaked under the bark. Figure 5. 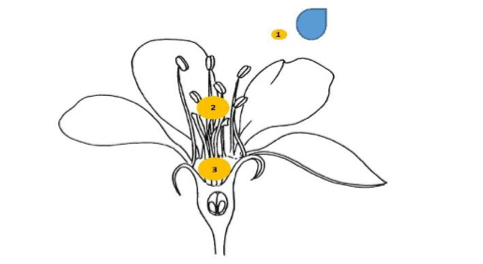 Pathogen cells (1) multiply on the flower stigma (2) and if rain or dew occur are washed into the floral cup (3). Erwinia amylovora overwinters within diseased plant tissue (e.g. cankers). In 20 to 50% of cankers active cells survive the winter (van der Zwet and Beer 1991) and when humidity is high in the spring the pathogen oozes out of these cankers. This ooze is attractive to bees, flies and other insects who transfer the blight pathogen to flowers. Pathogen cells can also be moved from old cankers to flowers by splashed and wind-blown rain. Pathogen cells multiply quickly on nutrient-rich floral stigmas when temperatures are warm (70-80 F is optimal for the pathogen) (Ogawa and English 1991). Bacterial colonies can then be washed down the style into the floral cup by water (usually from rain or heavy dew) where they can invade flowers through the nectaries. Once initial blossoms are infested, insects and rain can move the pathogen to additional flowers (Pattemore et al. 2014, Johnson et al. 1993). If the pathogen is successful in infecting the developing fruit-let, the disease spreads into the cambium (just between the bark and the wood) of the tree, killing young host tissues as it progresses (Momol et al. 1998) creating characteristic strikes and cankers. Pathogen cells migrate inside the tree well ahead of visible symptoms where they can accumulate in other susceptible tissue such as one-year-old shoot tips and susceptible rootstocks causing infections distant from the original infection point. Erwinia amylovora can also infect susceptible one and two-year-old tissue directly through wounds (e.g. insect feeding and hail) causing shoot blight infections. Plant on resistant rootstock. Resistant rootstocks (e.g. Geneva series for apples) do not make the scion less susceptible, but will help prevent tree death from rootstock blight. Sanitation. In winter, cut out old blight cankers as thoroughly as possible. Ideally, cut blight before you prune for tree structure so that the blighted cuttings can be removed from the orchard. Compared to cuts made in summer, winter removal cuts can be made closer to the visible canker edge. In winter the pathogen is confined to the cankered area. Cut at the next “horticulturally sensible” site below the canker. You do not need to sterilize tools when you are cutting on fully dormant trees. Late dormant copper applications may also provide orchard sanitation, reducing inocula levels going into spring (Elkins et al. 2015). During the summer, cut out blight when you see it. Make summer cuts AT LEAST 12-18” below the edge of the visible canker. Cut more aggressively in young, vigorous trees or susceptible varieties. Removing a strike can greatly reduce further damage to the tree if cut early. Manage the orchard environment. In addition to warm temperatures moisture is required to create infections. As little as two to three hours of wetting is sufficient to trigger infections. Manage weeds/cover crops to limit relative humidity. Do not irrigate during bloom. Blossom removal in young blocks. Blossom removal in young blocks and removal of late blooms limits the numbers of flowers and thus reduces potential points of infection. Keep vigor of the tree moderate. Moderating vigor will not prevent infection, but it can reduce damage to the tree. The risk of fire blight infections during bloom can be calculated based on the temperature and moisture. In Washington, the best prediction model is CougarBlight available at WSU Decision Aid System for Tree Fruit (DAS). This model calculates fire blight risk based on the temperature of the previous four days using the documented growth rate of the bacteria, e.g. higher risk with multiple hours above 70 F. (Pusey and Curry 2004). The model then projects risk for the next three days based on predicted temperatures. Growers can use model information to decide when to spray. If trees are likely to be blooming during an upcoming high-risk period, protective sprays are recommended (Smith and Pusey 2010). There is a risk of fire blight infection any time there are flowers on the tree, the weather is warm, and wetting occurs. Watch for and protect secondary blossoms during the three weeks after petal fall, which is the most common time of fire blight infection. Most sprays only protect the blooms that are open. Protect new blooms as they open. In warm weather, follow-up sprays are needed every few days. Prebloom. Fixed-copper sanitation, but only if fire blight was in the orchard last year. Early bloom. Apply biologicals (Blossom Protect) during early bloom. If fire blight was in the orchard last year, apply two applications of the biological. Re-apply biologicals a second time if lime sulfur was applied. Lime sulfur applied during early bloom is also antimicrobial and reduces blight pressure. Early bloom to petal fall. Watch the model. After a period of warm weather, best results are obtained when antibiotics are applied within the 24-hour window before flower wetting during a high infection risk period. Products used must contact the interior of the flowers in sufficient water and approved wetting agent to completely cover the interior. Repeated antibiotic sprays may be necessary during extended high or extreme risk periods. One pound of any 17% oxytetracycline product per 100 gallons gives a 200-ppm solution. Kasugamycin is another effective antibiotic. Some trials have shown that a full rate of Kasugamycin and a full rate of oxytetracycline provides excellent control. Antibiotics plus Actigard (2oz) has increased control in WA and OR trials by 10%. Applications of less than 100 gal/A can be effective on small trees if flower interiors are well covered, but do not drop the ppm below 200 (oxytetracycline). Application by ground equipment on each row is highly recommended (aircraft is NOT recommended). Many fire blight bacteria in the Pacific Northwest are resistant to streptomycin, another registered antibiotic. Petal fall to two weeks after. Continue protective programs one to two weeks post petal fall. Warm conditions during late bloom increase fire blight risk for late blooms still present. Prebloom. Fixed copper sanitation if fire blight was in the orchard last year. Early bloom. Lime sulfur plus oil (apples only). One to two applications of biologicals (Blossom Protect). Reapply biological after lime sulfur, which is antimicrobial. Full bloom to petal fall. Depending on the cultivar russet risk and the CougarBlight model risk follow with Bacillus subtilis (Serenade Opti) (most fruit safe) every 2-5 days during flower/petal fall or copper hydroxide/octanoate (e.g. Cueva, Previsto) every 2 to 6 days (less fruit safe for russet). Coppers have had higher efficacy than biologicals during bloom in Washington trials. Do not follow coppers with any products with acidifiers. Good drying conditions are important to avoid russet risk. Figure 6. Relative control from coppers WSU Trials 2013 to 2017. Coverage. Product efficacy is based on thorough coverage of flowers. Use tree row volume to apply appropriate volumes to cover the tree architecture in your orchard. Products applied every other row or at high speeds may have insufficient coverage and lower efficacy. Timing. Antibiotics have the highest efficacy when applied shortly before a moisture event. Nonetheless, Kasumamycin and Streptomycin can also be applied up to 12 hours after a moisture event, but with reduced effectiveness. Streptomycin has locally systemic activity and Kasumamycin is effective on bacteria which have been washed into the floral cup but not yet invaded the flower. pH of spray tank water. It is important to appropriately acidify spray tank water when using antibiotics (especially oxytetraclycline and kasugamycin). 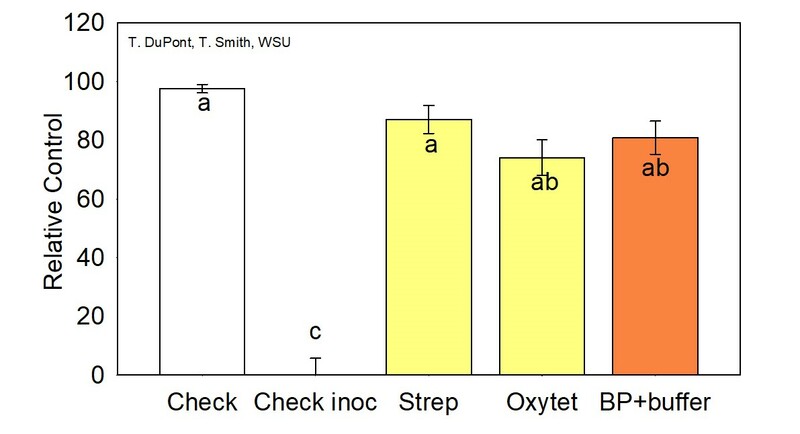 Antibiotic efficacy reported in WSU trials is with spray tank water acidified to pH 5.6. At higher pH antibiotic degradation rate is higher and thus efficacy is often lower. For example, in one trial Kasugamycin reduced bacteria by 86 to 96% at pH 5.1 but only 21 to 35% at pH 7.3 (Adaskaveg, Forster, and Wade 2011). Use appropriate rates. Quantity of active ingredient is important to obtain efficacy. 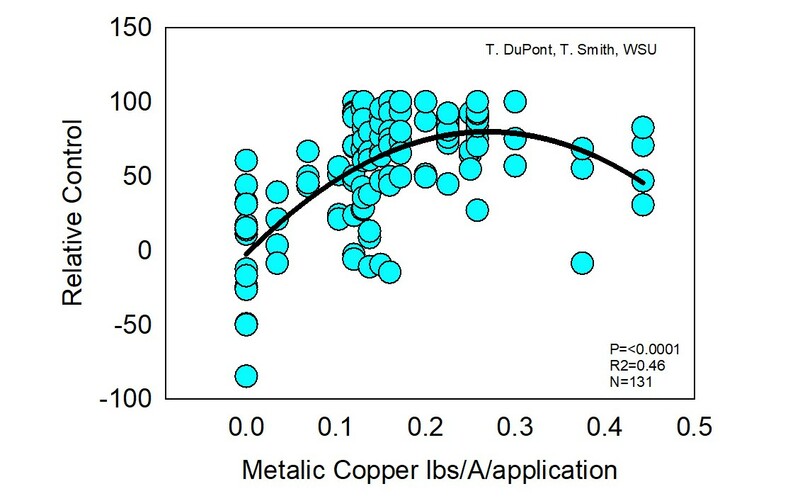 For example, recent work looking at rates of copper products is demonstrating that as metallic copper content increases, copper product efficacy increases up to approximately 0.2 lb metallic copper per 100 gal per acre. Mixtures. A full rate of kasugamycin (100 ppm) with a full rate of oxytetracycline (200 ppm), as well as streptomycin (100 ppm) mixed with a full rate of oxytetracycline (200 ppm) have provided improved efficacy in some trials (Oregon 2015-2018). Actigard (2oz) plus an antibiotic applied during bloom has improved the efficacy of antibiotics an average of 10% in trials in Washington and Oregon (Smith and Johnson 2011-2014). Figure 7. Blossom Protect in WSU Trials 2013, 2014, 2016, 2017. 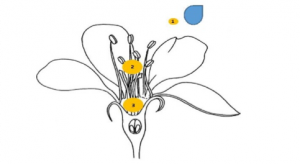 When applied to open flowers, these micro-organisms produce colonies on the stigma surfaces and nectary. With biological materials (e.g., Blossom Protect), spray treatments need to be initiated relatively early in the bloom period before high fire blight risk has developed. Blossom Protect is a combination of two strains of Aureobasidium pullulans, a yeast that occurs naturally in Pacific Northwest pome fruit flowers. This organism grows on the nectary and stigmas of treated flowers and competes directing with the fire blight pathogen for the nutritional resource available on these surfaces. Blossom Protect is applied with a companion buffer, Buffer Protect, which reduces the pH of the sprayed suspension and helps the yeast grow faster than the pathogen. In Pacific Northwest trials, Blossom Protect has been the most effective bio-control organism to date (Johnson et al. 2014). If this product is used, it is important to spray every row at least once. Figure 8. 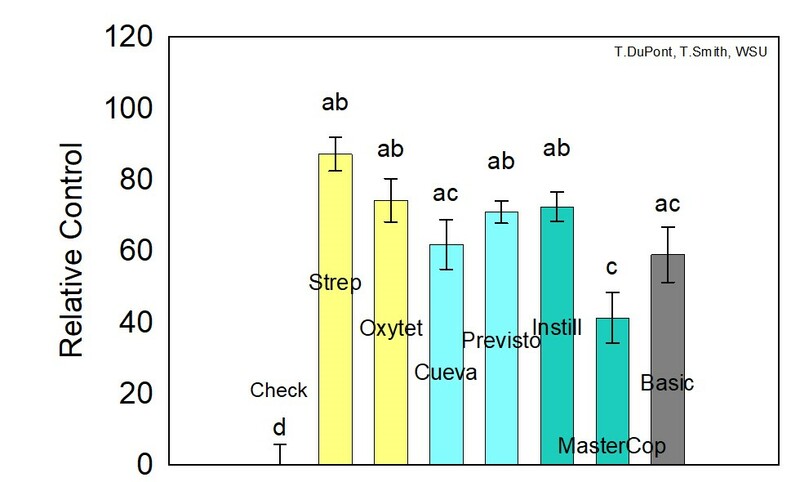 Percent control from antibiotics in WSU Trials 2006, 2009, 2010, 2011. Kasugamycin (tradename: Kasumin) is a recently labeled antibiotic that provides good levels of control (~80%). All Erwinia amylovorastrains are currently sensitive to this material but there is an intermediate risk of resistance developing to this antibiotic (Adaskaveg, Forster, and Wade 2011). 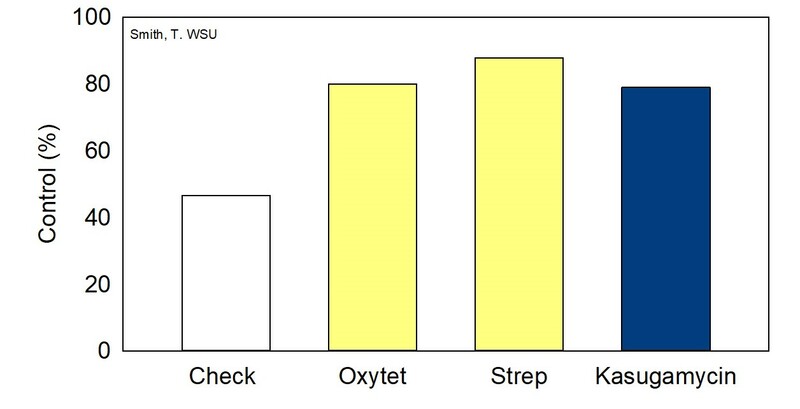 Kasumin controls streptomycin-resistant strains of E. amylovora. Kasumin provides forward control for two to four days prior to rain events (on flowers open when applied) and will be partially effective for blossom blight control if applied within 12 hours after a rain event. 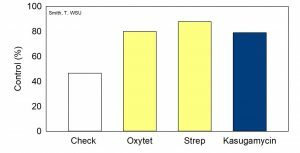 Kasumin is not locally systemic like streptomycin. Thus, Kasumin will not penetrate into the nectaries and will not be able to control an infection once the fire blight pathogen reaches the nectaries. Acidifying spray tanks (target 5) is important to reduce antibiotic break down and extend activity. Oxytetracycline (tradenames: Mycoshield, FireLine) generally provide good levels of control in Washington trials and has a low risk of resistance development. Oxytetracycline products should be applied within one day prior to a rain event for best results. Oxytetracycline is considered bacteriostatic (inhibits bacterial growth). Thus, it has to be applied prior to rains where it can prevent growth on stigmas. Oxytetracycline is also sensitive to UV degradation and much of the activity is lost within one to two days after application. Acidifying spray tanks (target 5) is important to reduce antibiotic break down and extend activity. Streptomycin (tradenames: Agri-Mycin, FireWall): Streptomycin-resistant strains of the fire blight pathogen have been present in Washington orchards since 1975 (Coyier and Covey 1975, Loper et al. 1991). Recent tests have indicated that the proportion of the pathogen population resistant to this antibiotic has dropped, and expected control levels have improved (Forster et al. 2015). This product should only be used in combination with oxytetracycline, and should not be used unless a high to extreme risk infection period is expected. Limit use to once per season. Remaining pathogen colonies in the orchard should be assumed to be streptomycin-resistant. Figure 9. WSU Trials 2013, 2014, 2016, 2017. Cueva (copper octanoate) 3-5 qt; Previsto (copper hydroxide) 3-5 qt; Instill (copper sulfate pentahydrate) 1-1.85 qt; Mastercop (copper sulfate pentahydrat) 0.25-1.25 qt; Basic coppers Champ, Kocide (0.5 lb), Badge (1.25 pt). Rates 100 gall/Acre. Copper materials vary in the form and amount of metallic copper (the active ingredient). “Fixed” (copper hydroxides, copper oxychlorides) –copper products have a longer residual time and are generally used for delayed dormant (green tip) in bearing orchards and summer shoot blight protection in non-bearing (young) orchards. In fixed coppers, most of the copper is insoluble with soluble copper ions released slowly over time. Application of low-pH materials (e.g., Buffer Protect) to trees treated recently with a fixed copper can cause a large release of copper ions and increase the potential for phytotoxicity (Rosenberger 2011). Copper is toxic to plants when a sufficient concentration of ions penetrates tissue. Growers should avoid spray additives such as foliar nutrients and surfactants when applying coppers. Fixed-coppers should not be used with Imidan, Sevin, Thiodan, Captan, or phosophorus acid compounds (Fostphite, Prophyt, Phostrol, Agri-Fos, Alliete) (Shane and Sundin 2011). Soluble coppers. Newer copper formulations are designed to reduce copper phytotoxicity and fruit russeting potential by introducing far few copper ions to the plant surface and adding safeners that also reduce injury potential. Examples are Cueva (copper octanoate), which is a salt of copper and a fatty acid (copper soap), and Previsto, which is copper ions in a matrix with alginate (polymer from seaweed). Both Cueva and Previsto have shown little phytotoxicity in semi-arid Washington trials but have shown some risk of russeting in wetter areas of Oregon and California. Cueva is compatible in tank-mixes with Bacillus-based biopesticides, while Previsto is not due to its high pH. Acibenzolar-S-methyl (ASM, Actigard 50 WG), is a synthetic inducer of systemic acquired resistance (SAR). Its mode of action is to mimic the plant hormone, salicylic acid, which is responsible for priming the plant’s defense system. The level of protection is smaller compared to an antibiotic but it lasts longer, approximately a week (Maxson-Stein et al. 2002). Serenade Optimum is an apparently ‘fruit safe’ material, made by fermenting a strain of Bacillus subtilis. The antimicrobial activity of Serenade comes primarily from biochemical compounds produced by the bacterium during fermentation, and not because of the bacterium’s colonization of flowers in the orchard. An infected shoot has many millions to billions of pathogen cells. The highest concentration will be near the tip of the branch or infected floral cluster. By cutting a branch we hope to remove many of these cells so that they cannot flow through the tree where they may concentrate in other susceptible tissue and create new infections. Cut AT LEAST 12 to 18 inches below the noticeably infected area into two year or older wood in order to remove the highest concentration of pathogen cells. Young, vigorous or susceptible varieties will require cutting further. Removing infected tissue quickly increases the likelihood of removing more pathogen cells before they invade deeply into the tree. Some recommendations suggest an ‘ugly stub cut’ where growers make cuts 20-30 cm below visible symptoms into two-year-old or older wood (where resistance is greater due to carbohydrate reserves (Suleman and Steiner 1994)leaving a 10 to 12 cm naked stub. While small cankers will form on many of these cuts, these cankers can be removed during winter pruning (Steiner 2000). New research has shown that treatment of trees with the chemical, Acibenzolar-S-methyl (ASM, Actigard 50 WG), may reduce re-occurrence of blight after cutting out infected strikes. Re-occurrence happens when the act of cutting out the disease does not completely remove the pathogen cells that have moved ahead of the expanding canker. Plants have defense systems. If something stimulates the plant’s defense response before the symptoms develop (or re-develop), the plant will be in an active defense mode and will be less affected by disease when it occurs (or re-occurs). Actigard is a compound that has been found to trigger induced resistance. Its mode of action is to mimic the plant hormone, salicylic acid, which is responsible for priming the plant’s defense system. For more than five years, Dr. Ken Johnson of Oregon State University has found that painting a concentrated solution of Actigard on trees after cutting out infection reduced the severity of re-occurring fire blight cankers in pears. For example, he found that without treatment after cutting out fire blight cankers in young Bosc pear trees, the disease came back 50% of the time and began to run through the tree. With Actigard applications, both the proportion of trees in which fire blight came back and the rate of canker expansion was reduced (Johnson and Temple 2016). During the summer, cut out blight when you see it. Removing a strike can greatly reduce further damage on the tree, especially if you catch the strike early. Apply concentrated Actigard with an up and down motion to a ½ meter length of the central leader or major scaffold near where the fire blight infection was removed. Use the labeled rate of 1 oz/ 1 quart with 1% silicone-based penetrant. One quart will treat approximately 500 cuts. Visit for the recent model projections of blossom blight risk at your site. Crop Protection Guide recommendations are updated on an annual basis. Dealing with Fire Blight Once it is in the Orchard. WSU Newsletter article July 2017. Remember last year’s infections are this year’s risk. WSU Newsletter article April 2018. WSU Newsletter article February 2017. Adaskaveg, J.E., H. Forster, and M.L. Wade. 2011. Effectiveness of Kasugamycin Against Erwinia amylovora and its Potential Use for Managing Fire Blight of Pear. Plant Disease 95(4):448-54. DOI: 10.1094/pdis-09-10-0679. Coyier, D.L., and R.P. Covey. 1975. Tolerance of Erwinia amylovora to streptomycin sulfate in Oregon and Washington. Plant Disease 59:849-852. Elkins, R.B., T.N. Temple, C.A. Shaffer, C.A. Ingels, S.B. Lindow, B.G. Zoller, and K.B. Johnson. 2015. Evaluation of dormant-stage inoculum sanitation as a component of a fire blight management program for fresh-market bartlett pear. Plant Disease 99(8):1147-1152. DOI: 10.1094/pdis-10-14-1082-re. Forster, H., G.C. McGhee, G.W. Sundin, and J.E. Adaskaveg. 2015. 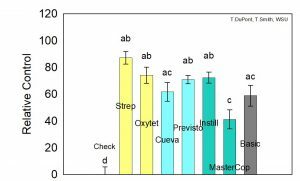 Characterization of streptomycin resistance in isolates of Erwinia amylovora in California. Phytopathology 105(10):1302-1310. DOI: 10.1094/phyto-03-15-0078-r.
Johnson, K.B. 2000. Fire blight of apple and pear. Plant Health Instructor. doi: DOI: 10.1094/PHI-I-2000-0726-01. Johnson, K.B., V.O. Stockwell, D.M. Burgett, D. Sugar, and J.E. Loper. 1993. Dispersal of Erwinia amylovora and Pseudomonas fluorescens by honey bees from hives to apple and pear blossoms. Phytopathology 83(5): 478-484. DOI: 10.1094/Phyto-83-478. Johnson, K.B., and T N. Temple. 2016. Comparison of methods of acibenzolar-S-methyl application for post-infection fire blight suppression in pear and apple. Plant Disease 100. Johnson, K.B., T.N. Temple, R.B. Elkins, and T.J. Smith. 2014. Strategy for non-antibiotic fire blight control in US-grown organic pome fruit. In Xiii International Workshop on Fire Blight, edited by F. Rezzonico, T.H.M. Smits and E. Holliger. Int Soc Horticultural Science: Leuven 1: 93-100. Kleinhempel, H., M. Nachtigall. 1987. Disinfection of pruning shears for the prevention of fire blight transmission. Acta Horticulturae 217. Lecomte, P. 1989. Risk of fire blight infection associated with pruning of pear trees. Acta Horticulturae 273. Loper, J.E., M.D. Henkels, R.G. Roberts, G.G. Grove, M.J. Willett, and T.J. Smith. 1991. 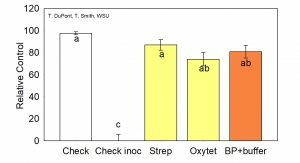 Evaluation of streptomycin, oxytetracycline, and copper resistance in Erwinia amylovora isolated from pear orchards in Washington State. Plant Disease 75:287-290. Momol, M.T., J.L. Norelli, D.E. Piccioni, E.A. Momol, H.L. Gustafson, J.N. Cummins, and H.S. Aldwinckle. 1998. Internal movement of Erwinia amylovora through symptomless apple scion tissues into the rootstock. Plant Disease 82: 646-650. Momol, M.T., and S. Aldwincklke. 2000. Genetic diversity and host range of Erwinia amylovora. In Fire Blight: The disease and its causative agent, Erwinia amylovora, edited by J. L. Vanneste. CABI, Wallingford, UK. Ogawa, J., and H. English. 1991. Diseases of temperate zone tree fruit and nut crops. Publication 3345. University of California Division of Agriculture and Natural Resources. Oakland, California. Ostenson, H., and D. Granatstein. 2013. Critical Issues Report: Fire Blight Control Program. The Organic Center. Pattemore, D.E., R.M. Goodwin, H.M. McBrydie, S.M. Hoyte, and J.L. Vanneste. 2014. Evidence of the role of honey bees (Apis mellifera) as vectors of the bacterial plant pathogen Pseudomonas syringae. Australasian Plant Pathology 43(5): 571-575. Rosenberger, D., 2011. Spring copper sprays for fruit diseases. In Scaffolds Fruit Journal. Cornel University. Shane, B. and G.W. Sundin. 2011. Copper formulations for fruit crops. edited by Department of Plant Pathology. Michigan State University Extension. Smith, T.J., and P. L. Pusey. 2010. CougarBlight 2010 ver. 5.0: a significant update of the CougarBlight fire blight infection risk mode. Acta Horticulturae 896:331-338. Steiner, P.W. 2000. Integrated orchard and nursery management for the control of fire blight.” In Fire Blight: The Disease and its Causative Agent Erwinia Amylovora, edited by Joel L Vanneste. CABI Publishing, New York, NY, USA. Suleman, P., and P.W. Steiner. 1994. Relationship between sorbitol and solute potential in apple shoots relative to fire blight symptom development after infection by Erwinia amylovora.” Phytopathology 84:1244-1250. Teviotdale, B.L. 2011. Fire Blight. UC Statewide Integrated Pest Management Program UC ANR Publication 7414. Toussaint, V., and V. Philion. 2008. Natural epidemic of fire blight in a newly planted orchard and effect of pruning on disease development. In Proceedings of the Eleventh International Workshop on Fire Blight, edited by K. B. Johnson and V. O. Stockwell, 313-+. Leuven 1: Int Soc Horticultural Science. van der Zwet, T., and S.W. Beer. 1991. Fíre Blight—Its Nature, Prevention and Control: A Practical Guide to Integrated Disease Management. U.S. Department of Agriculture, Agriculture Information Bulletin 631.